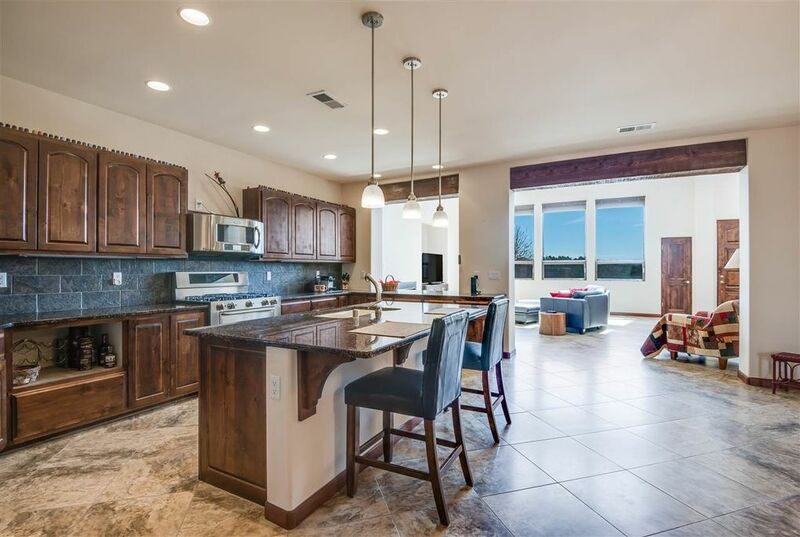 Lovely, sophisticated home in La Pradera with elegant finishes to highlight this fantastic Pueblo, light contemporary home. Light and bright, featuring soaring windows that inspire an atrium setting in the Great Room. The oversized kitchen is well equipped with high end appliances and custom cabinetry. Large Master bedroom features a comfortable fireplace and an adjacent Master bath with duel sinks, Large tub, and extraordinary walk in shower. Master Closet is equipped with closet inserts to organize your items. A curved stairway leads to the upstairs where there are two additional bedrooms, bathroom and loft area. The finished garage is not like most garages....it easily fits two cars in the front; but could allow for at least another in the rear....or provide space for a workshop or studio. Custom cut stone walls accent the out door spaces along with two portals for enjoying our terrific Santa Fe weather. This home is a gem, in a fine neighborhood, with easy access to the Community College and all of Santa Fe's amenities. Directions: Richards Ave. to Dinosaur Trail, head west to Camino Sabanero; turn left; house is on the right.